Female urinary incontinence, the unplanned or inconvenient loss of urine, is one of the most common diseases in women affecting between 12 and 55% of women across all age groups. This makes urinary incontinence more prevalent than hypertension, depression or diabetes. However despite the fact that all urinary incontinence leads to wet clothing or pads, not all women leak urine for the same reasons. This distinction is important because treatments are specific to the type and cause of leakage. Hence careful evaluation by your physician is necessary before deciding on surgical or non surgical options for incontinence. Urge incontinence is defined as the sudden and uncontrollable urge to void followed by urinary leakage. It is usually characterized by larger volumes of loss and is the most common cause of incontinence estimated to affect up to 17% of the global population. A classic example of urge incontinence is a person who comes home from work or an outing, and immediately upon placing the house key into the door, has an uncontrollable urge to void. This same person may feel the need to void when hearing running water or washing dishes. Another example would be a person waking up at night with an urge to void, and finding that they had already had an accident in bed. All of these scenarios describe urge incontinence, which is treated in a completely different manner than most other types of leakage. The first line of therapy is conservative, non-invasive, measures such as physical therapy or oral medications. Specialized physical therapists are able to affect change in women in short order and we are able to direct you to an appropriate therapist. Additionally, all prescription medications have side effects and we are devoted and able to manage these side effects with you and make sure that your current medications are not affected. Should these measures not succeed, there are additional, very effective options that are available. This minimally invasive treatment consists of a series of 30 minute sessions where a small needle is placed near a nerve in your ankle. Then mild impulses are sent through the needle and up that nerve towards the nerves in your pelvis that control the bladder. This treatment is performed once a week for 12 sessions and following a full course, between 60 and 80% of patients have a significant improvement in bladder control. Following the completion of a full course, maintenance sessions are scheduled every 3-6 weeks to maintain the effect over time. El Camino Urology Medical Group was one of the first practices in the Bay Area to provide this therapy for patients and has a proven track record of success and longevity of effect. Another way to get electrical nerve stimulation into patients is to implant a small pulse generator or pacemaker device discretely under the skin to stimulate the same pelvic nerves that control the bladder. Because this is performed surgically, electrical stimulation and effect can be maintained as constant over longer periods of time without the need to return to the office for additional sessions. Outside of academic institutions, El Camino Urology Medical Group has the most experience and training implanting and managing these devices in the Bay Area. The first step takes place either in the office or the operating room depending on your preference and is designed to make sure that your nerves and bladder are receptive to this therapy, a test drive so to speak. In this test phase, small electrodes are placed under your skin and near your pelvic nerve roots. You are then sent home with an external generator that will mimic the sensation of the final generator device. This trial period takes between 5-7 days and upon finding the expected increase in bladder control and decrease in accidents, we proceed to stage 2. Stage 2 must be performed in the operating room where, under x-ray guidance, the permanent electrodes and pulse generator are placed under the skin. Anesthesia will be used for this procedure however you will be more in a “twilight” phase and usually not require a breathing tube. Finally, you will be discharged home the very same day and will be enjoying the improved quality of life almost immediately. Illustration of neurotransmitter device implanted under skin. Electrical impulses are transmitted to the sacral nerves through the attached lead wire improving bladder and urinary control. 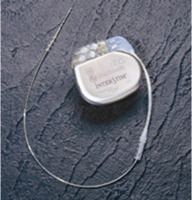 Illustration courtesy of Medtronic. Illustration of neurotransmitter device with attached wire electrode. The device is about the size of a silver dollar and about twice as thick and is easily hidden under the tissue and skin of the upper buttock. 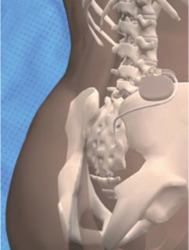 Illustration courtesy of Medtronic. The use of Ona-botulinum toxin A as a bladder injection was once reserved for patients with neurological diagnoses such as spinal cord injury and stroke. However the FDA gave approval for its use in the general population in late 2012. Ona-botulinum toxin A is the same medication that is used in other parts of the body in a wide variety of applications, stopping headaches, drying sweaty armpits, releasing muscle spasms and smoothing facial wrinkles. It has a period of efficacy anywhere between 4 and 9 months and works by uncoupling nerve control in the organ into which it is injected. In short, if injected into the face, muscles are made weaker and without tense muscles contorting the face, wrinkles are avoided. In the same way, the bladder is brought under better control. Urge incontinence occurs when there is an inappropriate contraction of the bladder muscle resulting in loss of urine. This explains how some one can have an accident despite being asleep. After being injected with Ona-botulinum toxin A, this spasm is smaller, if present at all and will result in decreased leakage and leak episodes. This is accomplished with an in office procedure, however we can arrange for this to be done in the operating room as well. Again, outside of academic institutions, El Camino Urology has been providing this service for longer and has performed more injections then most other groups in the Bay Area due to our advanced fellowship training and access to the latest techniques and equipment. Results are apparent within 1 week, with return to clinic upon return of symptoms. Most patients on this therapy return about once per year and are quite pleased in the interim. All patients considering this therapy must be aware that there is between a 6-8 % chance of urinary retention following this procedure, resulting in not only an absence of urinary leakage, but an inability to void as well. These patients are then required to learn to perform self-catheterization, or wear a catheter to drain the bladder until the bladder regains the ability to void. While this is clearly not an optimal outcome, the small percentage risk is often outweighed by the upside of increased control in patients tired and frustrated with the leakage and decreased quality of life that it causes. While less prevalent in comparison to urge type, stress incontinence is the more well known type of leakage. It is characterized as leakage upon coughing, sneezing, exercise, or engaging the core. Many women will transiently experience this following childbirth, with a large number continuing to leak even after all healing has occurred. Many women feel that this is just a normal part of aging and choose to endure, however we at El Camino Urology Medical Group would like to stress that you don’t have to live this way. There are excellent therapies available to put a stop to the leaks. Cure is absolutely possible and quite likely with minimal bother or risk, however a proper evaluation is of paramount importance to give you your best chance at success. Additionally, a person is not limited to having leakage from only one source, numerous types of incontinence are often found in the same patient and prospectively identifying this helps to set expectations appropriately. Stress urinary incontinence usually falls into two distinct categories having to do with a deficiency in the ability of the urethra to hold back a drop or stream of urine during provocative challenges. Mid urethral slings address the issue of hypermobility. In short, hypermobility is a condition where the urethra and bladder neck travel and rotate when pressure increases in the abdomen leading to slippage between the walls of the urethra ultimately breaking the natural seal and allowing the urethra to open inappropriately. The other principal cause for leakage in patients is known as intrinsic sphincteric deficiency (ISD). This is a condition where the walls of the urethra even at rest are not in contact with each other leading to easy and higher volume leakage with stress. While addressed to some extent with sling procedures, in select patients this is best addressed using periurethral injection therapy. While the treatment of urge incontinence starts conservatively and ends with surgical procedures, the treatment of stress incontinence is quite the opposite. Stress incontinence is most appropriately, and effectively treated with a surgical procedure and the gold standard of therapy is the mid urethral sling. El Camino Urology Medical Group is a high volume sling implanter, with resulting engrained routines and protocols that are key to ensuring attention to detail and quality results. There is greater than 15 year data showing the efficacy of these slings with low complication rates. Clinical trials have recently shown that after extended follow-up, 86% of women who have undergone this surgery are pleased with the results. Sling surgery is an outpatient procedure with the patient able to go home the same day often times without a urinary catheter. In fact, some patients don’t even wake up with a catheter in their bladders. During surgery, a small piece of macroporous polypropylene mesh is permanently implanted beneath the vaginal skin just beneath the urethra in a tension free manner. Recovery from these surgeries requires a 6 week period of decreased activity, however, the results are apparent almost immediately. surrounding the use of mesh in the vaginal compartment. Undergo rigorous training in the principles of pelvic anatomy and pelvic surgery. Be properly trained in specific mesh implantation techniques. Be able to recognize and manage complications associated with vaginal mesh. By providing fellowship trained physicians to evaluate and perform these surgeries, El Camino Urology Medical Group meets and exceeds this national standard. Intrinsic sphincteric deficiency (ISD) sometimes exists alone but can also coexist with hypermobility. In patients that present with continued leakage following anti-incontinence surgery, the most likely cause is ISD. As mentioned above, while addressed to some extent with midurethral sling surgery, often times the most effective therapy for patients with ISD is periurethral injection therapy. Due to the fact that at rest the walls of the urethra do not come into contact, they are not able to form an appropriate seal to keep urine from leaking. Hence, placing a filler material under the walls of the urethra elevates the tissue back into contact with its opposite counterpart re-establishing a competent seal. This procedure is performed in office and under a local anesthetic with results often seen that very day, and nearly complete continence established in the majority of patients in 3 injections or less. Risks include bleeding, infection and urinary retention, however, these are not very common and should be discussed with your consulting physician before the procedure. El Camino Urology Medical Group is one of the highest volume providers of this therapy, and one of the few in the Bay Area offering this as an in office procedure, avoiding the bother and expense of operating rooms and surgical centers.